Many investors assume their accounts have achieved good returns this year. After all, the S&P 500 Index is up nearly 9.5% through October 8, including dividends. 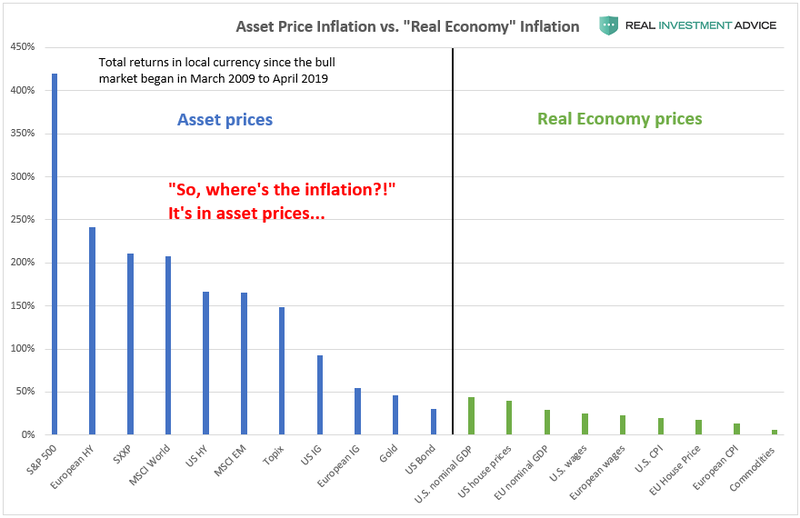 But that doesn’t necessarily mean your account has an inflation-beating return for the year depending on your bond and international stock exposure. And while bonds and foreign stocks have been drags on portfolios this year, owning them is no reason to change your allocation. But now is a good time for a portfolio assessment or a moment of understanding what you own and why – and how asset class returns have diverged this year. Let’s say you’re a balanced investor (around 60% stocks and 40% bonds) and you have all your money in one fund – the Vanguard Balanced Index fund (VBINX). That fund keeps 60% of its assets in U.S. stocks and 40% of its assets in U.S. bonds, and it’s up 4.29% for this year through yesterday. That’s a decent return, but it seems far away from the 9.5% return of U.S. stocks. If you’re guessing that bonds have been a drag on portfolios this year, you’re right. The Bloomberg Barclays U.S. Aggregate Index, the main U.S. bond benchmark is down 2.53% for the year. When 40% of your portfolio is down it will necessarily damp the effect from the part of the portfolio that has done well. And while that can make you wish you didn’t own any bonds, your bonds will save you the next time the stock market tanks – especially if they are government bonds. A 100% domestic stock portfolio – especially when the S&P 500 is trading at expensive valuations – probably isn’t a good idea for any investor. Most people can’t handle the volatility of a 100% stock portfolio even when the market is cheap on reliable long-term metrics like the Shiller PE. And you own bonds as a kind of insurance policy that happened not to pay off this year. That’s fine; you’re not supposed to make an insurance claim every year. So if you’ve captured a 4% return from your balanced portfolio so far this year, that’s a good return. If you own a balanced portfolio that’s diversified into international stocks, your returns are less appealing (though still not awful). That’s because the global stock market, measured by the MSCI ACWI Index, is up only 1.56%, a far cry from the 9.5% return of the S&P 500 Index. International stocks, both developed country and emerging markets, have posted losses this year in U.S. dollar terms. And since U.S. bonds are down 2.53%, a balanced portfolio of global stocks (assuming unhedged currency exposure) and domestic bonds is down 0.76% for the year. That’s a modest loss, but any loss feels worse than a 4.29% gain or a 9.5% gain. But, again, nobody should make dramatic changes to their portfolios or fire their advisor if their balanced portfolio has posted a loss. Many good investors have argued that foreign stocks are cheaper than U.S. stocks. They are likely to outperform over the next 7-10 years, so there’s a good reason to hold them. Also, as recently as last year, international stocks outperformed U.S. stocks. In 2017, the S&P 500 Index delivered a 22% return including dividends. But the MSCI EAFE Index for developed country foreign stocks returned 25% and the MSCI EM Index for emerging markets stocks returned a whopping 37%, both in U.S. dollar terms. So sometimes diversification benefits you, and sometimes it doesn’t. Sometimes owning a cheaper asset doesn’t pay off immediately. And it could happen that international stocks outperform domestic stocks next year again, despite a slowing global economy and currency issues for emerging markets due to a rising U.S. dollar. As it happens, Lance Roberts, who manages portfolios at Clarity Financial, has avoided international stocks for most of the year, and that has been a benefit to portfolios. He has written about his avoidance of international stocks here. Above all, remember also that you’re not in this for one year’s worth of returns. It’s true that analysts and pundits focus on ridiculously long periods of time that no normal human being has for investment purposes – 100 years, for example. But you don’t have one year either if you have stock exposure. You probably have at least 10 years, maybe 20, and possibly even 30, if you’re about to retire. That doesn’t mean poor years should be taken cavalierly, especially early in retirement. But If you have bond exposure and international stock exposure, understand why you have them and that it’s not always easy to predict how any asset classes will perform from year to year. Overall, if you have any kind of positive return from a balanced portfolio this year, you’re doing reasonably well. Please feel free to contact us if you have questions about this year’s returns, asset allocation, or retirement planning.